The future is looking bright for alternative lenders. Last week, based peer-to-peer lending service Lending Club (LC) went public with a splash: it raised $870 million, making it the largest U.S. tech IPO this year, according to PrivCo. 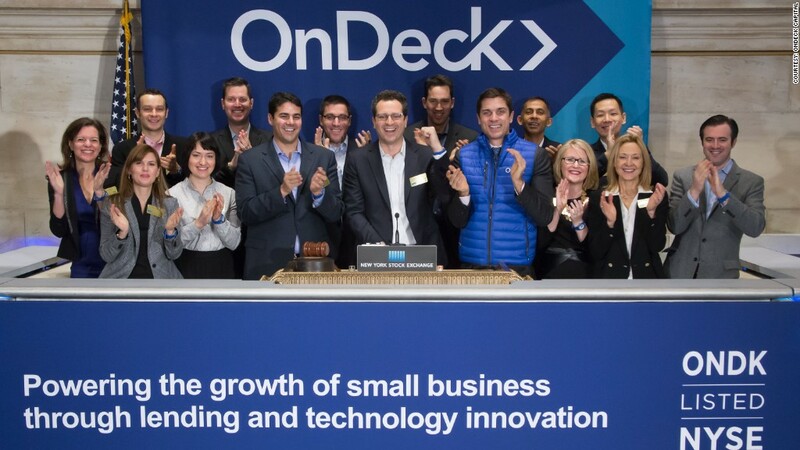 On its coattails, OnDeck Capital (ONDK) -- another alternative lender -- went public this week, raising $200 million. A wealth of non-traditional alternatives have popped up online over the last eight years. They cater to those who need fast cash -- and who might not qualify for traditional bank loans, which tend to require flawless credit and have exhaustive approval processes. Many have websites that are "reminiscent of a social platform," said Mitchell D. Weiss, adjunct professor of finance at the University of Hartford. "Its clean, its crisp." It's helping them capture the attention of millennial entrepreneurs. 14% of millennial small business owners have turned to non-traditional lending services, according to a recent Bank of America survey. That's substantially more than older generations. Only 1% of Baby Boomers (ages 50 to 68) and 3% of Gen-Xers (35 to 49) have received funding from non-traditional lenders. Related: Non-bank loans: Quick, easy...and addictive? "Millennials are on the earlier curve of their small business ownership and entrepreneurial paths," said David Solis, sales performance manager at Bank of America. "It makes sense that they're going to be pursuing alternative forms of lending." While the vast majority of millennials are still more apt to first seek help from friends and family, online service providers cater to their inherent trust in social platforms. Weiss agrees: "The whole idea for [seeking loans] online is a generational thing." The fact that both Lending Club and OnDeck have gone public could have profound implications for the broader lending market. "There is a cloak of dignity that an IPO layers on top of something like this," said Weiss. OnDeck founder and former CEO Mitch Jacobs agrees that alternative financing startups might finally be getting their big break. "The timing is best explained by the whole innovation cycle. Both companies started to address [financing] issues at a time when the technology had just become available to help solve the problem," said Jacobs, who has founded four financial tech companies. "There's a lot of investor interest in financial technology, and there's enormous market potential." Even the Small Business Administration -- which offers more traditional loan programs -- is aware of the need to branch out with more products for new small business owners. "The [SBA] could benefit from a modernization effort," said Maria Contreras-Sweet, the SBA commissioner. "The marketplace is vast and technology provides a lower threshold. We need to understand these new dynamics: How do we support them, which ones make sense?"